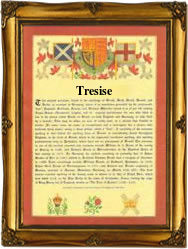 Recorded as Tresise, Tresize, Trezise, Tresithe, and others, this is an English, but specifically Cornish surname. It is locational from any of several Cornish farms or hamlets such as Trezise at St Martins in Menage, or Tresayes at Roche, both in West Cornwall. The derivation is from the pre 12th century Cormish 'Tre-saws' meaning the place of the Saxons, a reference to English settlers in the county. The name is also found in Wales, but is again of Cornish or Breton origins, although there is some argument that the second element may be derived from the personal name Rhys, meaning the dashing or passionate one! The name is recorded heraldically with Cornwall having its own College of Arms. The blazon is a silver field, charged with three horizontal bars in black, and it was granted at the visitation of heralds at Exeter in 1620. Amongst interesting early examples of the recordings is that of Jonathan Trefise as spelt. This was dated 1679, at St Peters Parish, in the Barbados, during the reign of King Charles IInd of England. He was known as The merry Monarch, and reigned from 1660 - 1685. Surnames became necessary when governments introduced personal taxation. In England this was sometimes known as the Poll Tax. Throughout the centuries, surnames in every country have continued to "develop" often leading to astonishing variants of the original spelling.